Lauren Patton as Lexa. Photo provided by Theatre Prometheus. Directed by Theatre Prometheus artistic director Tracy Erbacher, the play is the story of two sisters, who take a road trip from their native Texas to New Mexico so that one of the sisters can get an abortion. It is written by the fantastically witty Rachel Lynett, the managing director of Arkansas Theatre Collective, and the company manager at Arts Center of the Ozarks. 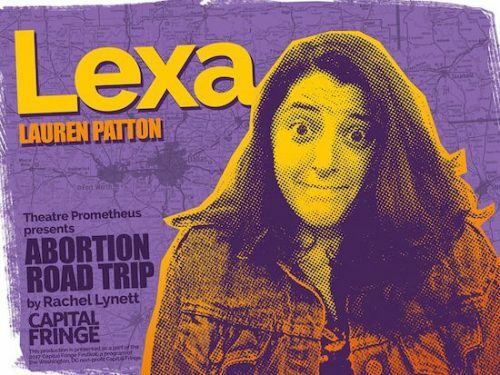 Associate artistic director of Theatre Prometheus Laura Patton stars as Lexa, the sister who is having the abortion. Patton is masterful at portraying Lexa’s struggle between an emotional rock and a hard place. Her conflict doesn’t stem so much from the procedure ahead of her as it does from her relationship with the sperm donor Seth and from the actual physical obstacle of getting to the clinic. Dominique Brown plays Lexa’s worldly sister Minnie. Compared to Lexa, Minnie is a closed book and Brown expertly navigates her subtle inner world. Vassar graduate Rachel Messbauer plays Minnie’s girlfriend Quinn, who develops into the central antagonist of the story. Rachel is best in her scenes of unexpected coldness and internalized disgust. The real scene stealer is Capital Fringe veteran Renae Erichsen-Teal as the quiet but strong taxi driver known only as “Driver.” Erichsen-Teal brings an intelligence and a joy to the character. The heart of the play lies with this subtle character and her relationship with her wife Taylor, beautifully played by Thais Menedez. Eric McMorris, Theatre Prometheus veteran and frequent collaborator with Avant Bard and Studio Theatre served as the production’s technical director. This is a play written and sculpted by incredibly talented people and McMorris’s technical team is no exception. Theatre Prometheus veteran Yannick Godts designed the lights and the set, and Newcomer Tosin Olufolabi designs sound. The protests did little to quell theatregoers, in fact the house was nearly three-quarters full on a Saturday morning. No small feat. Erbacher described her decision to produce this play for the Capital Fringe Festival occurred after the recent election and determined to do something that would help. “This play isn’t about me or Theatre Prometheus. This play is about the people who are pregnant and who don’t want to be… We chose this play because it’s time for a new narrative about abortion.” Right on, let’s get heavy! “Abortion Road Trip” at Trinidad Theatre will run through July 23. For tickets and more information click here.